The space of Retzius can be reached by an intraperitoneal or an extraperitoneal approach. The suggested advantages of the extraperitoneal approach include not entering the intraperitoneal cavity, decreased risk of vascular and bowel injury, and bypassing intra-abdominal adhesions (23-24). Decreased blood loss reportedly is due to instillation of CO2 gas at 20 mmHg into the extraperitoneal space, causing compression of capillaries (23). 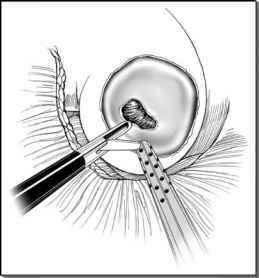 Some authors suggest the extraperitoneal dissection allows better vision and gives the added advantage of using regional anesthesia (22,23). It also allows lower placement of trocars, making it easier to reach the operative field. At one center (24), extraperitoneal laparoscopic Burch was cheaper than open Burch ($3100 vs. $6000). In several experiences, this extraperitoneal dissection is reported as faster and cheaper than open or laparoscopic transperitoneal Burch, with comparable cure rates and high patient satisfaction (22,25-27). Possible complications include higher rates of cystotomy, subcutaneous emphysema, inadvertent entry into the peritoneal cavity, conversion to open or intraperitoneal Burch, and exclusion of patients with prior abdominal surgery (22,24,26). Prior surgery is not a contraindication in some centers (27,28). Extraperitoneal laparoscopy can result in greater degrees of carbon dioxide absorption than transperitoneal surgery, increasing the chance of pneumomediastinum and pneumothorax (26,29). FIGURE3 ■ (A) Superior (laparoscopic) view of space of Retzius with four Burch sutures in place. 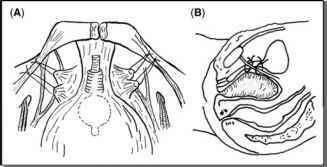 (B) Parasagittal view of Burch sutures attached to Cooper's ligament. It is uncommon to see a patient who requires only a Burch colposuspension; therefore, the intraperitoneal technique is the more common approach in many centers. 3 cm above the suprapubic bone and 2 cm lateral to midline, avoiding the inferior epigastric vessels. The remainder of the procedure is carried out similar to the transperitoneal Burch. Mesh and tacks are utilized more often than sutures in the extraperitoneal Burch literature. Cure rates reported for both techniques are comparable to that for open Burch. It is uncommon to see a patient who requires only a Burch colposuspension; therefore, the intraperitoneal technique is the more common approach in many centers (10,30-32). Most patients requiring pelvic reconstructive surgery need additional procedures including apical vault support, paravaginal repair, anterior and/or posterior vaginal repair, or other intra-abdominal procedures (33).